Does your business depend on high-quality lead generation? 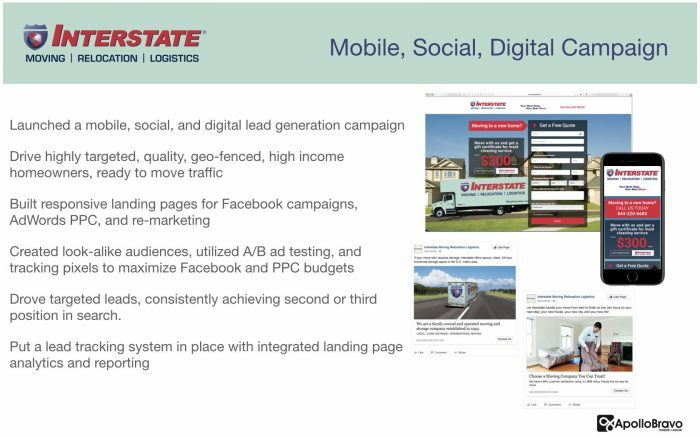 Interstates does, that’s why they chose ApolloBravo to develop a fully integrated digital marketing campaign combining Google AdWords, Facebook, lead tracking, and remarketing. The campaign utilized tracking pixels to cross-promote to visitors from search and highly targeted Facebook advertising. ApolloBravo, a Google Search Partner, regularly achieved top positions in search marketing generating hundreds of qualified leads from consumers ready to move.